Having good results like these are a great present this Christmas. I am thankful that, if we had to go through this, that at least the preliminary results are good. My daughter is healing well, is up and about a decent amount for 10 days post surgery, and has very little pain, when taking her medications properly. In cases like ours, surgery was necessary. The spine was nearly up against the ribs – where was the room for her lung? Now, there will always be a curve, but she has room for regular lung function and a chance at reduced pain in the future. We still don’t know what will be in store for her lower curve, but we will tackle the issues as they come. And, in the meantime, I realize how much of a weight is off me now – how long has the prospect of this surgery bore down on me? How long had it seeped into every area of my life? I didn’t even realize until last night, going to Christmas Even services, how much easier I can breathe now – how my stomach is not constantly in knots. I never wanted this surgery for her, never wanted ANY of it! But, we were dealt this hand, so we had to play through it, and the game is not over yet. But, for now, I can breathe easier and rest easier because we got this far. Whew! I have decided to stop categorizing my posts as Day X of recovery because we are out of the hospital, out of the really difficult part, and onto the rest of a less regimented recovery time. There are a lot of ups and downs now that we left the hospital as well, though. This morning I woke up to our entire part of Michigan being covered in thick ice. This tree is what we saw when we looked in the back yard of my in-laws’ house. I felt so bad for this little birch tree – it looks like it’s under so much stress, that it could snap at any minute, but it just keeps holding on. This tree kind of reminds me of me – yesterday we had highs and lows – our daughter is awake for longer periods of time, but she still wasn’t eating well and it was worrying me. And, still sleeping a lot. I thought we could reduce pain meds to get her to stay awake more (and her pain levels were very low), but then her pain shot from a 2 to a 5 on a perceived level of pain scale of 1-10 (10 being highest). So, we had to get the meds going at the previous intervals again. I was feeling low – worried that we may have to eventually get her back on an IV because she couldn’t stay awake enough to eat or drink and has almost zero appetite. Worried that my previously very thin child is now just down to skin and bones. So, I had an emotional moment. Plus, the fatigue adds a “weepiness factor” on top of everything. And, then I was concerned that my parents couldn’t make it down to celebrate Christmas with us (because we can’t get up there for Christmas and the ice storm was coming with a vengeance). So, I was upset and I had to get it out a bit. My husband was gone most of yesterday for a basketball game for his team, and he assured me that he would try very hard to get fluids into her the next day and tried to give me a bit of hope. And, then this morning, she woke, ate a big breakfast and stayed awake long enough to watch a movie. It was a tiny bit miraculous. So, I kind of felt like I could come up a bit under the tension, just to ease up a bit and relax. And, my parents are able to come down! Should be here in an hour or so! And, we apparently are lucky enough to still have our electricity, which many families do not. So, things are looking up today and I am continually grateful for the power of prayer. We have had so many friends and family, as well as people we hardly know, lifting up our daughter in prayer. It’s overwhelming and unbelievable, and it seems to be working. I just keep trying to remember to keep pushing up my burdens, like pushing upward on the sagging limbs of this tree, pushing them heavenward so I can come out from under the weight. 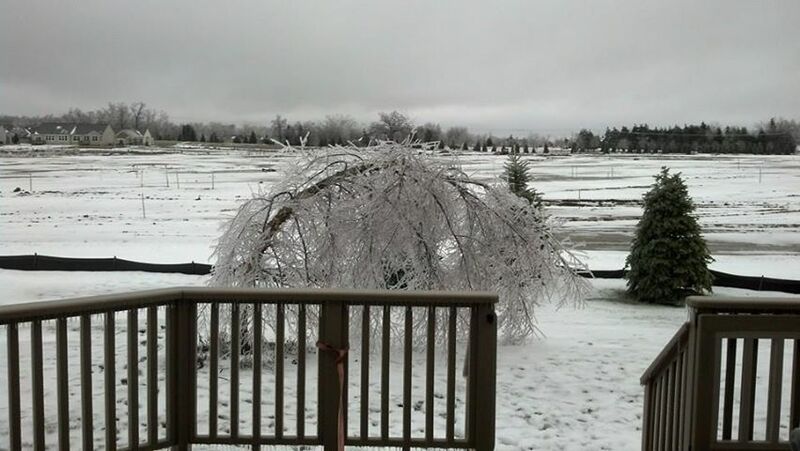 So, here’s to bending, but not breaking…as for this tree…we are still hoping for the best. Day 4 recovery – leaving the hospital! What is it about being in a hospital that makes a person feel – well – sick? It is, then, miraculous that when they LEAVE the hospital, the patient is all of a sudden so much better than they were 1 hour before at the hospital. That is what happened yesterday. We passed Physical Therapy by walking the stairs, and walking all over the floor (although she still hates sitting), and we passed the medical side of things when she ate and drank (barely) enough to get by without IV fluids. And, our daughter was VERY motivated to leave, so we took the plunge. We were fortunate that the temp stayed high enough that the freezing rain all around us gave us a short window of opportunity to get to my in-law’s house (where we plan to stay until just after Christmas). We timed her meds so that she had her Valium 1/2 hour before we wanted to leave, and – like the Valium magic we have become accustomed to – she konked out hard all the way home. Not a peep or a stir for the drive that, for many patients, is pretty painful and grueling. We got to my in-law’s 1 hour later and she climbed into “Grandma’s super squishy bed” and just sighed a huge sigh of relief. The same as she sighed when she got out into the cold, fresh air for the first time in 5 days. Now, as I write this on Day 5 of recovery, she still hates to sit, but she is happier, more comfortable, and I finally got her to drink a small cup of my fruit smoothie (that contains all the nutrients she needs for her body). I am thinking that tomorrow we will cut her pain meds down even more – her pain is incredibly and miraculously low, and every time we reduce meds, she becomes more alive and more happy. We are so grateful that her pain is low and that she is so much happier now. Tomorrow (Day 6 of recovery), my parents drive down for a pre-Christmas dinner, so we can celebrate together without moving her again. ‘Tis the season, and now we are finally feeling a little bit jolly. The first night after surgery went well – we were still up every hour with the usual check-ins (making sure she could move her limbs, that her blood pressure was high enough, etc), but Andy and I surprisingly got some sleep on the fold out benches in the room. Today we are hoping to get moved to the 12th floor to regular recovery rooms. Our daughter wants to move – her muscles are tight and they were not able to give her valium to loosen them until she was taken off the blood pressure medication. They have also been giving her medications to combat the nausea. Since starting the Valium, she has been able to tolerate ice chips. She has not really complained of pain from her surgical site – more so the stiffness in her lower back and the horrible Foley tube. 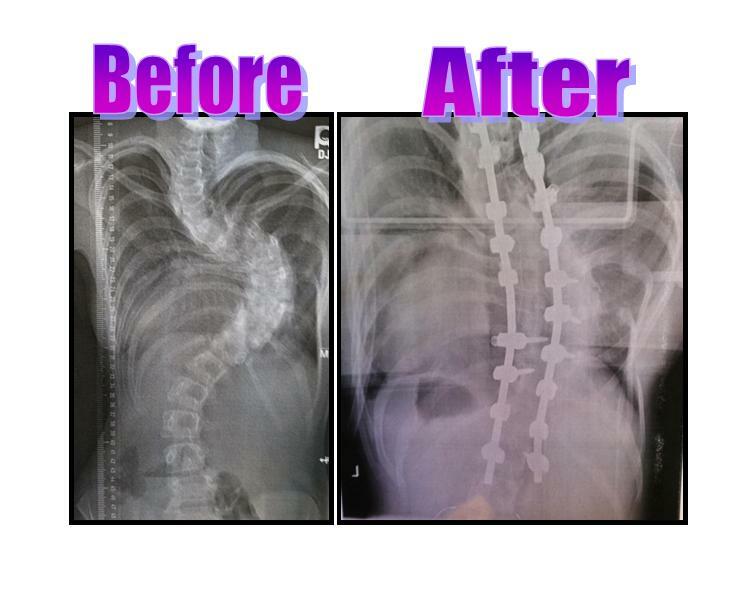 A while after I started writing this blog, I came to the conclusion that we were destined to run the entire course of this condition called Scoliosis – and, until today we had experienced everything but ONE thing – the big, daunting, terrifying thing called surgery. And, today, we have made it through that. Today was surgery day – the day we have been fighting against for 6 years. The day that we did everything up to now to avoid. And, as other Moms who have gone before me have said, it was “not as bad as you think it will be”. Sure, it has been hard and scary and all those other things – but, we have been enormously blessed today by the success and talents of the Doctors and staff here at University of Michigan Mott Children’s hospital. And, I have to say, I believe due to our friends and family surrounding us with love and prayers. Our daughter has been a trooper through it all – even when coming out of anesthesia, she was joking and in good spirits. She is resting soundly now, as we wait for an ICU room, but I was anxious as I waited for 8 hours in the waiting room for news. The wonderful thing is that we had parent pagers, so the staff in the O.R. could send text messages directly to our pager. So, every hour and a half or so they would tell us she was doing great. When we finally got the call to go up for our consult with the Doctor, we knew we were close to being done. When she first entered the room, the Doctor said, “That was really tough”. Apparently, because our daughter started with Juvenile Scoliosis and was diagnosed so young, her curve has become very stiff and inflexible over the years. Therefore, the Doctors had to work much harder to move the spine into the desired location. The Doctor said she would be trying to perform a procedure where she would shave down the bone between the vertebrae to create more room for the spine to move over. She was hoping to do 3. However, after 1, the neuro team lost neural impulses to her left side – they were not sure if there was a loose lead or if she was indeed experiencing side effects from the work so close to the spinal cord. Therefore, the Doctor had to stop doing the bone shaving and make the best of what she could – she did not want to risk paralysis. She also had to use hooks instead of screws in some places because the part of the vertebrae that they attach to was so minimal in some areas. Hooks may not hold on as tight, but she couldn’t risk putting in screws that might not stay put – a screw can do more damage if it breaks loose than a hook. So, the Doctor did the best she could – she was hoping for more correction, but she still took it down from about a 92 degree curve to approximately 41 degrees – which exceeded her expectation of a 50% improvement in Cobb Angle curve. We were not disappointed with this result, but still the Doctor had hoped for more. Other implications are that she was unable to have an epidural coming out of surgery, so is reliant on her PCA (Patient Controlled Analgesia) for pain management. The Doctor said that it is important to keep her blood pressure high to keep blood flow strong to her spine, so that her spinal healing will be more rapid. We are watching that closely. The nurse in the recovery room said that we couldn’t have hoped for a more smooth transition from Anesthesia. Our daughter woke up relatively happy, joking around with her Dad and messing with her swollen lips and mouth (we were told to expect the swelling as a result of laying with her face down all day). But, she was pretty coherent and has been drifting in and out of sleep all evening as we wait for our ICU room. At one point, she wanted to roll to her side, and we went to assist her, and she just flung herself on her side all by herself. The nurse said it was pretty incredible for a child coming out of this surgery. We have been shocked, overwhelmed, and comforted by the amount of friends and family who are sending love and prayers. We cannot thank everyone enough and appreciate all the love.